Why upgrade your condition monitoring software? It is essential that the condition monitoring technology of your machinery is always up-to-date. The software upgrade of your PROGNOST®‑NT software delivers all advantages of our ongoing product developments. In the linked brochures, we will introduce you important innovations and enhancements of the last condition monitoring software releases which will help you carry out your monitoring tasks faster and more effectively. 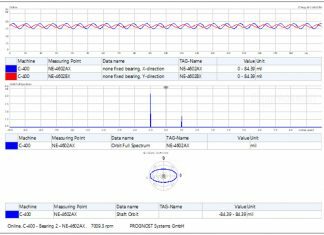 PROGNOST®-SenSim is a portable device for the simulation of sensor signals. It simulates static and dynamic signals for measuring loop test routines. PROGNOST®-Predictor helps you to manage critical areas in your process. Whether your priority is to reduce off-quality production, increase efficiency, lengthen equipment life or reduce unscheduled downtime, this solution offers management tools and expert advice to help you to achieve your goals. Combining all of the PROGNOST®-Predictor capabilities results in optimal health of your machine and supports your Preventive Maintenance to Predictive Maintenance management. PROGNOST®-NT is the perfect solution for critical and uncritical Rotating Equipment. Machine operators who need to extend their MTBM (Meantime between Maintenance) by early failure detection rely on at least some of the PROGNOST®-NT software modules.